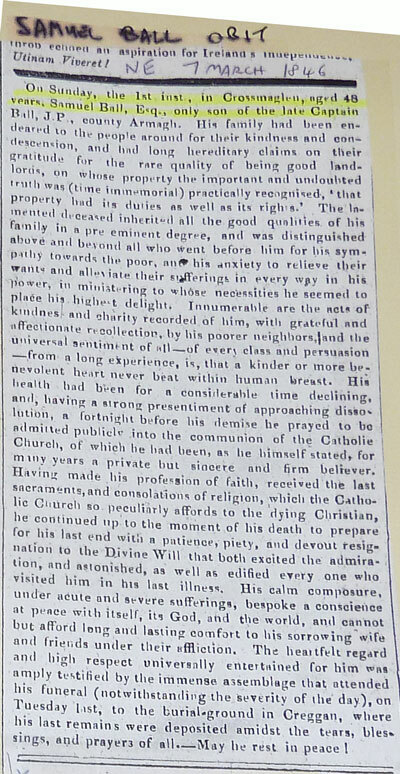 Obit for Samuel BALL, son of Captain BALL. NOTE: The BALL family held the lease to Urker Lodge, home of JACKSONs. Samuel BALL (1798-1846) was one of 8 children, the others all girls. His mother was Mary HOWARD. His wife was Mary O’CALLAGHAN, and they had two children: Thomas BALL and Mary BALL From The Ball Family Records: Samuel Ball, Jun., Churchwarden of Creggan, 1835, married by Armagh Dio. Lic., 1840, Mary O'Callaghan (R.C. ), who died July 14, 1892, at her son's residence, Belfast; Samuel and Mary Ball had issue : (I),Thomas Ball, M.D., 12, College Square East, Belfast; (2), Mary Ball. Samuel BALL obit: NT. 25 July 1843 On the 23rd inst, at Crossmaglen, Co. Armagh, in his 86th year of his age, Samuel Ball, Esq. late Capt. In his Majesty’s Royal Marines.